With the reversion of Okinawa prefecture to Japan in May of 1972, an ionospheric-observation facility operated by the U.S. National Oceanic and Atmospheric Administration (NOAA) in Chatan Town was converted into the Okinawa Radio Observatory of the Radio Research Laboratory (presently the National Institute of Information and Communications Technology), Ministry of Posts and Telecommunications. Later, the observatory was transformed into the Okinawa Electromagnetic Technology Center. 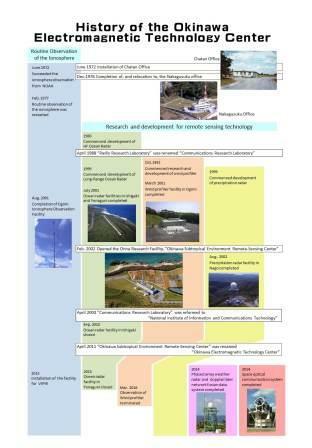 Since its establishment, the center has collected ionospheric observation data and promoted further development of environmental remote-sensing technology, including HF ocean radars, wind profilers and rain radars.